You can see a PO4 150 running on youtube... Ideal for use as a Phosphate Reactor to keep iron based media in suspension. Can be used for a multitude of filter media, such as phosphate remover and activated carbon and as a fluidised sand filter. Bio pellets can be used with ease..
Just remove the sponges and use the trays provided. 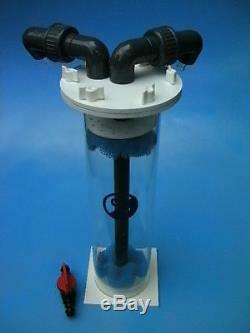 Designed has a free-standing in cabinet or sump reactor. Also comes with a Control Valve for flow adjustment. Pump Requirement: 1000 lph - 2500 lph. Max Capacity : 1500 mls of media (Fluidised). Base footprint: 130 x 130 mm. The item "Pro 300 Reactor (1300l). For phosphate, Bio Pellet/ Pearl, phosban and carbon" is in sale since Sunday, March 29, 2009.